Pilot Officer James Martin Warner - note the gun. He joined 950 Squadron, No.20 Balloon Centre and was commissioned as an Acting Pilot Officer in the Equipment Branch on 9th September 1939. The Scapa Flow barrage was the first to be set up and authorized after the outbreak of war. This was the "Q" Plan. This was initially two flights of balloons. This involved removing two balloon sets from each London Squadron. Hydrogen was an issue and 152 balloons were needed to the east of Scapa to defend fleet anchorages from torpedo carrying aircraft and around the fleet anchorage to protect shipping from low flying attack. Initially 16 balloons were sent up made up of two flights of balloons and administered as a single squadron. Initially Hoy and Flotta were used as balloon sites, Flotta to have 4 sites and Hoy to have 12. An additional 32 sites were also earmarked for future sites on both Hoy and Flotta. 948 Squadron was to be formed at No.4 Balloon Centre at Chigwell. The "Q" plan was suspended until 20th November 1939 and then a revised concept was produced. The 16-balloon unit was to be 48 balloons by March 1940. A new squadron of 48 balloons in six flights was formed and to be known as 950 Squadron. This included men from Balloon Command who had been trained in kite flying at Mullion. This was because it was thought that kites flown as a armed barrage might well perform better than balloons at Scapa Flow. The navy set up shipments of 120 hydrogen cylinders per week from the mainland and the narrow island roads meant that the usual 3-ton lorries and gas trailers were not of use so small gas trailers were used carrying 10 cylinders only. New navy-built piers were built to land the squadron at Lyness on Hoy and to deliver the balloons for deployment at Flotta. In addition, the construction of a rest camp, MT repair shop, hospital unit, water supply system and messes was essential. Each airman was issued with 5 blankets, thick gum boots and waterproof clothing. The war office knew that the "Q" plan was one where there was very little local labour, landing piers were inadequate, roads needed widening, water supplies were scarce, and lighting was by oil lamps only. There were no baths on the island. An evaluation indicated that 3 months work would be needed just to get the first 16 balloons into use. Further reviews led to the decision to think about use waterborne balloons on self-propelled lighters. A total of 40 sites were earmarked on Hoy and Flotta if waterborne options were not taken up. The barrage had to be operational by 1st March 1940 to protect the fleet base anchored there. As a result, it had to be flying by 14th February 1940. The Air Ministry ordered 48 balloons be flying by 1st March 1940. The wind on the Orkneys meant that the cable from which the balloons flew ought to be much thicker than normal, but due to time constraints this new cable did not materialise in time. In addition the standard winches drawn by 3 ton lorries became essential this was a nightmare on the small narrow roads. 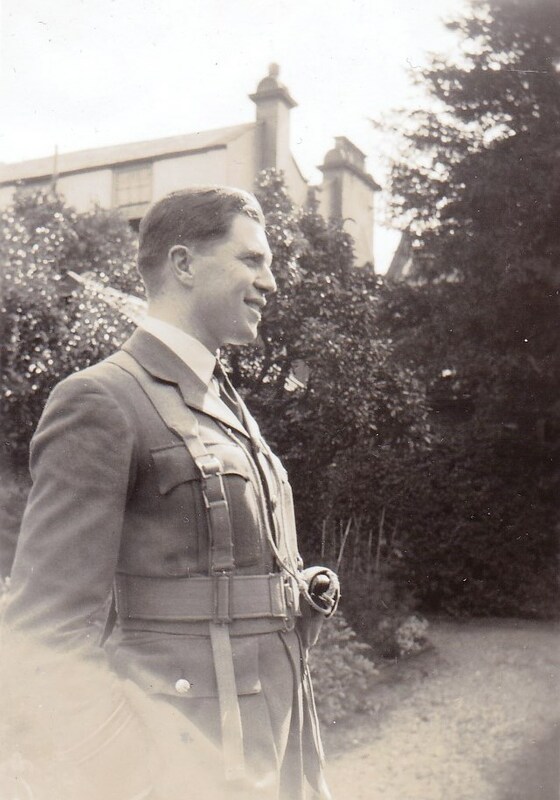 On 2nd February 1940 Wing Commander R. Risk M.C., set up the HQ for 950 Squadron. He was very pragmatic about the conditions he found and warned the Air Ministry that the conditions were "grim", and it was unlikely that they could meet the proposed deadlines set out. The advance parties were set to work erecting huts as no labour was to be found. The stormy weather prevented equipment landing on Hoy. One of the navy piers was washed away and 3 attempts at landing hutting accommodation on Pan Hope Prior was futile. By 12th February some 20 men were on Flotta. Light vehicles, hutting, winches and trailers had been landed. On 20th February 1940 the final party arrived with more balloon equipment and on 22nd February 1940, 8 balloons, 3 from Flotta, 5 from Hoy were flown for 14 hours. Over the next few days it was apparent that several balloons were damaged due to the high winds. Wing Commander R. Risk M.C., required concrete beds for future balloons, such construction could only be done by airmen because of no local labour. Even so he aimed to have 18 sites by the end of March and a further12 by the end of April. On 27th March 12 balloons were flown including two from trawlers. At the end of March storms, lightning and winds caused considerable damage to the balloons deployed. Even so it was decided to fly extra 8 balloons from Cava (2) and Fara (4), and Long Hope on Hoy (2). Also balloons from trawlers were required. All this caused issues with hydrogen supplies, due to unloading issues, and sea transport. In April 1940 German air attacks began at the Scapa Flow anchorage, particularly on the harbour booms. A number of aircraft were destroyed but the Wing Commander Risk M.C., was confident that the balloon deployment had prevented any low flying by German aircraft. By this time 40 sites were approved with 8 more on Fara and Cava and 8 more on trawlers. Sea transport of hydrogen was problematic, and no local hydrogen plant had been set up. Some additional ships were used to bring hydrogen from Scotland to Lynce. On 29th April 1940, 15 balloons, 10 on land, 5 on trawlers were flown. For the first time kites were deployed, at 4,500 feet this used a 3-foot kite with a 2-foot pilot kite. The wind broke the line between the kites but indicated that kites were a successful option. In May 1940 the 56 balloons were to be set up as a wing of two squadrons. This required a Balloon Centre, Squadron HQ at Lyness flying at 28 land sites, divided up into two flights of 8 balloons and two flights of 6 balloons, with a second Squadron on Flotta flying at 28 balloon sites made up as two flights of 8 land sites each, and 12 waterborne balloons. Then 4 extra trawler sites were asked for. However, the land sites were reduced by 4 keeping the number of balloons deployed the same. 950 Squadron at Lyness would fly four flights of 8 balloons at land sites, and a new Squadron 960 would fly 16 waterborne sites, divided into two flights, and a flight of 8 land sites. A trawler base was set up at Rinnigill on Hoy and it was intended to set up a hydrogen plant there. As a result, No.20 Balloon Centre was formed at Lyness in August 1940. This controlled 950 Squadron, four flights of 8 balloons, (Flotta 16, Hoy 16). 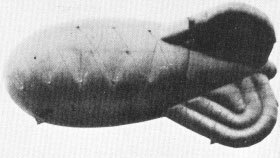 960 Squadron was two flights of 8 waterborne balloons based on Rinnigill and one flight of 8 land sited balloons (Fara 5, Cava 3). The pier at Rinnigill was not suited to trawlers so the HQ of 960 Squadron was moved to St. Mary's Pier, Holm, on Mainland. Pilot Officer Warner was attached to 950 Squadron at Bishopriggs from No.18 Balloon Centre on 29th January 1940. His role was equipment duties which involved ensuring all items that should be in stock were present and any shortages minimised. At 8 a.m. that morning all the balloon winches and gas trailers proceeded to Glasgow docks. 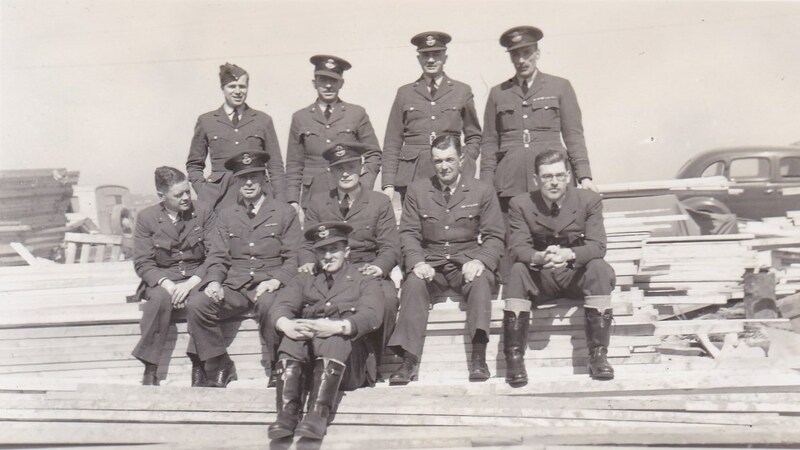 Corporal McLean and six other ranks stayed at the docks to provide a guard for the equipment for the next two days..
At Bishopbriggs on 1st February 1940 at 8.a.m., Pilot Officer Warner organised a fatigue party at the docks loading the Steamship S.S. Floristan. This was supervised by Flight Lieutenant Hereford. At 4 p.m. at Bishopbriggs, the Headquarters Party, which included Pilot Officer Warner, paraded fully equipped before travelling North. At 8 p.m. the Headquarters Party paraded at Squadron Headquarters at Bishopbriggs and were transported to Bishopbriggs railway station, the travelling arrangements being made by No.18 Balloon Centre. The Headquarters Party consisted of Wing Commander Risk, M.C., Flight Lieutenant Underhill M.C., Pilot Officer Warner and 90 other airmen. At 9.44 p.m. the special train left Bishopbriggs with Headquarters Party on board. On 2nd February 1944 at 9 a.m., Flight Lieutenant Hereford supervised the loading of 24 Balloon winches and other equipment aboard the S.S. Floristan. The special train arrived at Thurso railway station at 10.30 a.m. and was met by Flight Lieutenant Plummer Liaison Officer Scottish Command. The unit was taken to Thurso rest camp for food and was then they embarked on “Earl of Zetland” and crossed over to Lyness arriving at 5 p.m. Meanwhile at Lyness at 7 a.m. that day a party of men were engaged in hut building and road making under Pilot Officers P.M. Brooks and W.M. Jack. On 3rd February the fatigue party had completed the loading at the docks of S.S. Floristan by 3.25 p.m.
On 20th February 1940 despite heavy rain, by 9 p.m. the balloons were inflated and flying at Lyness. At 2 p.m. Pilot Officer Warner left Lyness by embarking on S.S. “St. Ninian” for Thurso and from Thurso caught the train to Balloon Command for Equipment Duties at Balloon Command Headquarters. Now Back to 74294 Squadron Leader James Martin Warner below. The Orkneys were geographically remote and the bad weather in the winter was a test of patience, ability and endurance. Harold A. Underhill wrote that: "in the early part of the year conditions were severe, with extreme cold, and it was the practice for officers to sleep pullovers, scarves and Balaclavas". minefield. The very first party of men arrived at PanHope Bay and proceeded to begin the erection of huts. wells about three feet deep. The island was devoid of trees, shrubs or bushes and scrap timber from hut construction was in great demand. A Naval Ration Party collected rations from the shore landings and all services collected their supplies from this point. Wind was the bane of their existence. It got in everywhere and came from all directions-sometimes all at once. It lifted huts up and sometimes blew them down. Balloons were often blown away. Despatch riders had a very difficult job as their motorbikes were constantly caked in mud and rain causing considerable issues with maintenance. Roll neck pullovers, gum or thigh boots were the standard dress on the island. Airmen looked more like trawler men than service personnel. The wearing of thick "fisherman socks" was adopted with enthusiasm by all ranks. Civilian transport was very primitive. There were very few horses, mot forms of haulage was done by teams of bullocks. The bullock drawn carts were usually homemade, wheels and all, with no brakes, bogies, or shafts. When making a turn it could only be skidded around and at least the mud assisted this turning. extrication was never easy. Thus the art of "De-bogging" became an almost daily sport for all and everyone was expert at it in time. Deep mud was often responsible for pulling gum boots off men's feet. Deep mud often came past the tops of men's gum boots. Many ideas were suggested as to how to deal with mud. One hilarious idea was to use aN agricultural tractor and using spare wood create a mud plough to scrape the mud away. Mud Plough Mark I and Mud Plough Mark II were not a success! Heath Robinson would have been in his element. In the early part of June, "A" Flight decided it was warm enough to bathe in the sea, it was brought to an abrupt stop when sharks began to be seen just off shore in the bay! fish! At low tide, so called "Lobster Parties", would take place. This was where the officers would search through the seaweed and rockpools for marine life that was edible, including lobsters. it was impossible, although the spaniel loved it. Eventually a motor-cycle and sidecar were commandeered and the driver, Commander and Scapa flew along the road to investigate. Scapa loved the ride! trains were drawn along the rails by horses and their feet were covered in special rubber overshoes to prevent the risk of their horseshoes striking a iron rail and creating a spark. On night rounds Scapa the spaniel and the Flight Commander would do their rounds from sentry to sentry and of course Scapa the spaniel always knew the easiest route back to H.Q. in the dark! 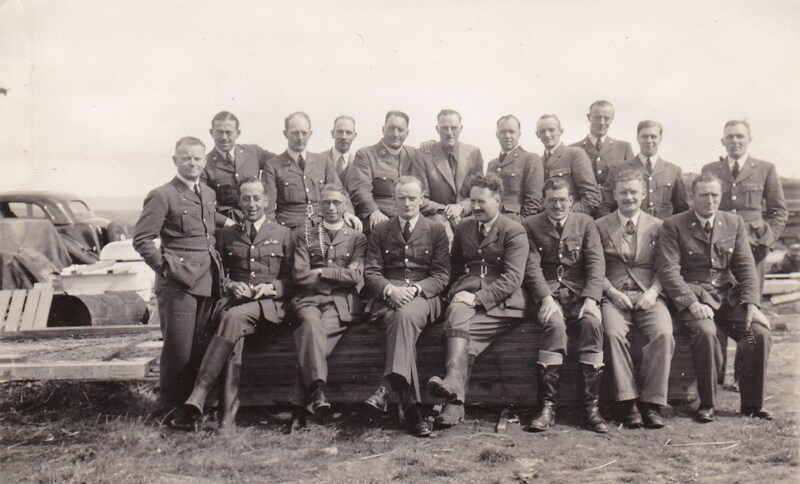 Middle Row L-R: Flight Lieutenant Lawson, Flight Lieutenant Crane, Squadron Leader Hornsby Smith, Flight Lieutenant Gregory, Pilot Officer Knight. Mr Mowatt, Flight Lieutenant Carter. 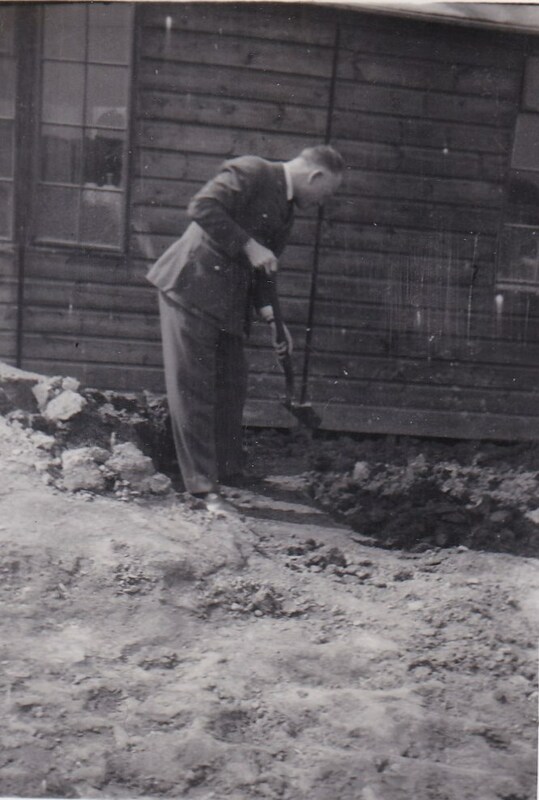 Flight Lieutenant P. M. Brooks digging out a drain for the hut.